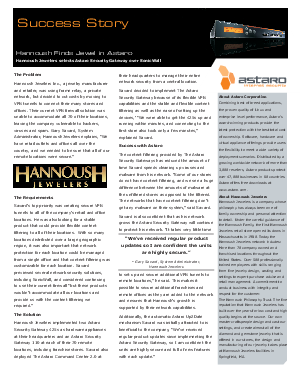 Hannoush Jewelers Inc., a jewelry manufacturer and retailer, was using frame relay, a private network, but decided to cut costs by moving to VPN tunnels to connect their many stores and offices. Their current VPN firewall solution was unable to accommodate all 70 of their locations, leaving the company vulnerable to hackers, viruses, and spam. The top priority was creating secure VPN tunnels to all of the company's retail and office locations. The organization reviewed several vendors, including SonicWall, but ultimately selected the Astaro Security Gateway. Download this free case study and read why Astaro was considered a cut above the rest.